People from Indiana love their pizza. There are plenty of options from national chains to the more popular regional chains. Pizza King and Harvey Hinklemeyers are two of our favorites, and recently we discovered a third called HotBox Pizza. 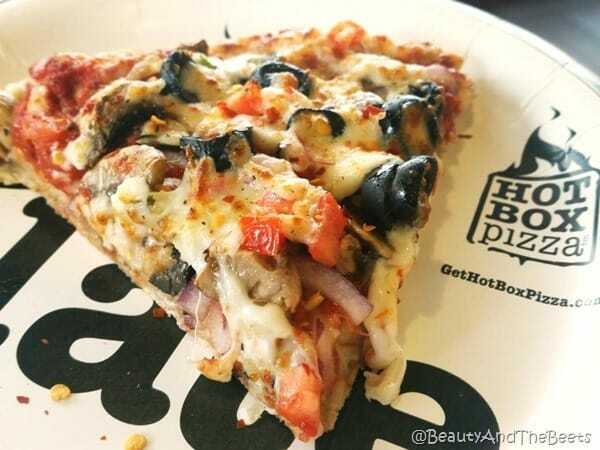 HotBox Pizza has 20 locations in and around the Indianapolis area. On our visit, Mr. Beet and I started with the Italian Stallion salad. Only we forgot to ask for it without the pepperoni but it is easy to pick out, so it was no big deal for us. The salad was huge and under $4 so we can’t complain. 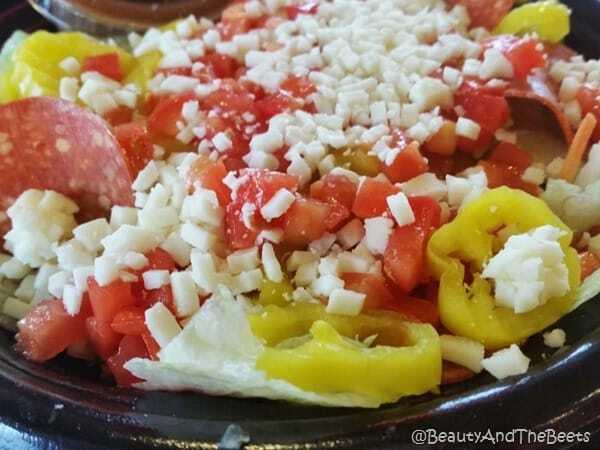 Besides the pepperoni, the salad is loaded with banana peppers, tomatoes and mozzarella cheese. Breadsticks for me are hit or miss in Indiana pizza shops. Some are really unseasoned and doughy, while others cook them well with lots of seasonings. 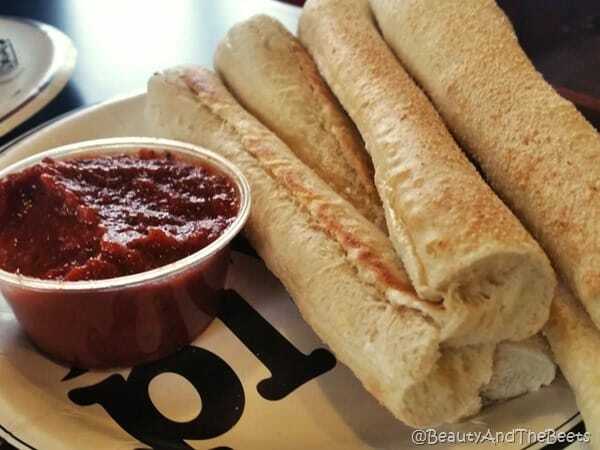 I found the HotBox Pizza breadsticks to be in between the two. Though they were a little on the doughy side, they were seasoned with garlic and cheese quite well. We ordered the Heavy Veggie pizza to split. 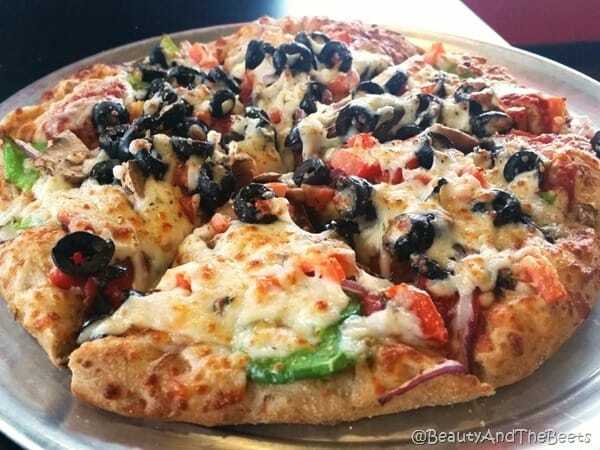 This pizza pie is LOADED with fresh veggies like green peppers, onions, mushrooms, tomatoes, and black olives. The crust was puffy and thick and most importantly, NOT doughy. 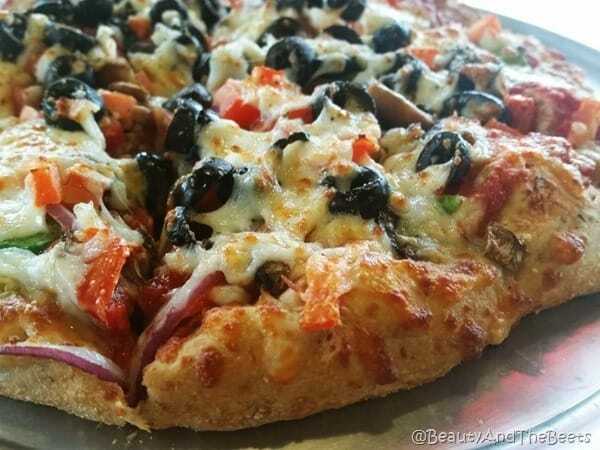 HotBox Pizza can certainly holds its own against some of the major pizza guys. 4 out of 5 sprouts. I should always remember to not look at your food/restaurant blogs until AFTER I have eaten 🙂 That pizza looks so good. You also always take great pictures.